Orange Beach gulf-front condo for sale at Phoenix East II. This 1 BR beachfront property has approx. 800 sq.ft. overlooking the sugar-white beaches and the Gulf of Mexico. This resort home would be an ideal real estate investment and/or beach escape – community amenities include an outdoor pool, hot-tub, BBQ grills, private balconies, etc. Schedule a time to see this condominium! 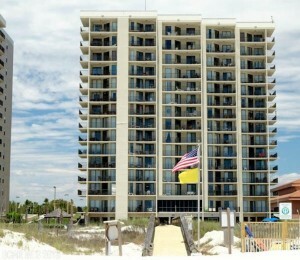 Phoenix East I-II condos in Orange Beach are adjacent properties that share many amenities. These beachfront residences are great as a real estate investment and/or a second home. The community amenities at these complexes include indoor & beachfront pools, BBQ grills, tennis courts, racquetball courts, saunas, hot tubs and more. The properties are convenient to entertainment, dining and shopping venues.